The Dream Car Tour is 3+ hours of pure, unadulterated awesome: A unique and exciting driving adventure that puts you behind the wheel of six different exotic sports cars for an adrenaline-filled drive through some of the most fun roads in the country. You'll experience the thrill and excitement of the world's greatest cars -- a hand-picked selection of Ferraris, Lamborghinis, Aston Martins, Bentleys and more -- as you pilot each magnificent vehicle along the highways, byways and mountain roads they were designed to live on. At the end of the day, you'll leave exhilarated (and maybe a bit giddy) with a certificate of completion, photos to remember your experience and, of course, the world's biggest smile. And the whole shebang is available for just $1,195 . You've got to walk before you can run. You'll start your day with a thorough overview of each vehicle. Our professional instructors will take you through the rules of the road and the safety (and performance) features of each car. You'll want to know how to shift, adjust the mirrors, and, of course, which side the seatbelt buckle is on. Next, it's off to our staging area. You'll get settled in your first vehicle of the day - and the anticipation will start to boil over. We'll run some radio checks (we have two-way radios in each car so you'll never be out of touch) and make sure everyone is buckled in for launch. Now comes the fun part. You'll pilot each vehicle for 15 heart-stopping miles. With the wind in your hair and the glorious sound of engine in your ears, you'll quickly understand why these are the greatest machines ever built. After each leg, the group will pull over at a designated checkpoint and you'll rotate cars with your fellow drivers. Of course that's just an excuse to let you catch your breath (and maybe mug for the camera a bit). Think that was fun? Well you're only 1/6 of the way there. You'll drive each car in sequence, getting a chance to compare and contrast the performance and handling characteristics. 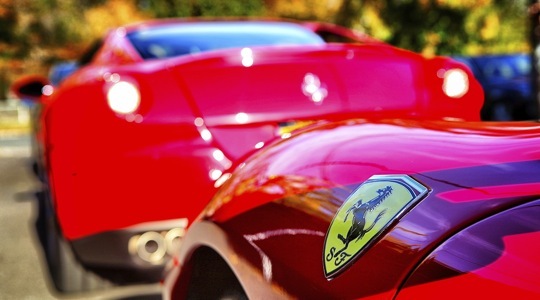 And you'll learn the answer to that ever-elusive question - are you a Ferrari guy? A Lamborghini girl? Or maybe you're James Bond in training. Whether you're younger, older, male, female, married, single, or none of the above, The Dream Car Tour is an experience you'll want to have under your belt. We've had 1000s participate and everyone leaves with a grin. "The route of the tour is a strategically planned mix of highways, mountain roads and side roads - a course that Gotham has refined down to a science." "I have been reliving the experience in my head ever since that exhilarating evening. 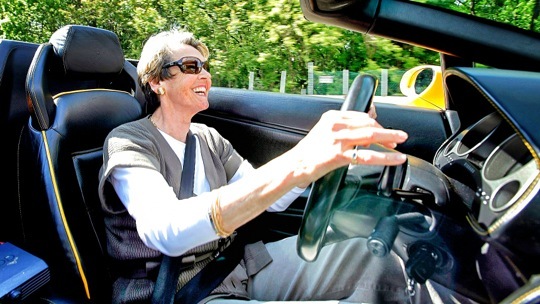 The perfect gift for any car enthusiast of any age, the Dream Car Tour is a must-do event." "The day's experience was exhilarating and amazing and now falls into my 'Top 5' list of automotive experiences." "My husband and I had the driving experience of a lifetime! I just want to thank you all so much for everything that was done to make this day so special. It was so much fun and unique to have this opportunity to drive all of those incredible cars." "My goodness. That was one of the best $$ I have ever spent in my life. The first 30 minutes with the Aston Martin was worth it alone. My goodness. 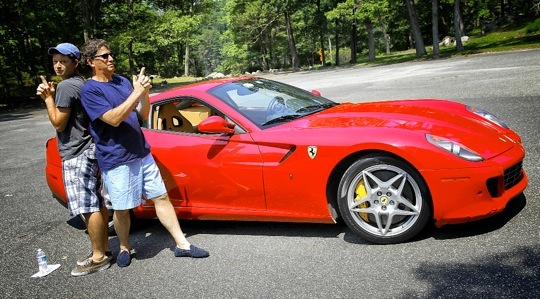 The soul of Enzo was with me as I flew through New Jersey in the F430 and I could not believe the screaming roar of the Lambo Gallardo Spyder as we zipped by ... What a day ... what an experience!" "THANK YOU AND WOW! That experience was everything I had hoped it could be. I would do this again in a heartbeat and HIGHLY recommend to anyone who likes cars to do this. The staff were great, the cars well-prepped and the route easily documented. It was all very professional. I wish I could have spent all day in any one of these cars." 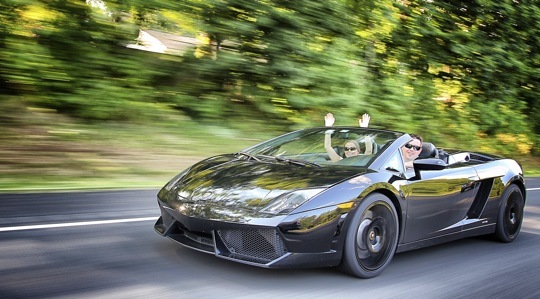 The Dream Car Tour is an exotic car driving experience. We gather six awesome exotics cars and a group of drivers and take everyone on a 3+ hour, 100+ mile real-world driving adventure. Every ~15 miles the group pulls over and everyone switches cars, so you'll have a chance to sample a variety of amazing cars. Think of it as a tasting menu of supercars. When and where is the Dream Car Tour held? You can participate in a Dream Car Tour on Tuesday, Wednesday, and Thursday of select weeks at various locations around the nation. Not usually. For most of our vehicles, we put you behind the wheel and your passenger rides along with you. For a few select vehicles with extremely limited visibility (such as the Lamborghini Murcielago), a GDC staff member will ride with you to assist with any tight turns and provide a second set of eyes. Absolutely! In fact, passengers can ride along with you free of charge, so bring whoever you'd like. But please do limit yourself to one guest. Most of the cars are two-seaters, so there simply isn't any place for others to ride. And please, make sure all passengers can comfortably fit in the passenger's seat and be buckled in - we do not permit car seats on the Tour. We don't suggest this. We drive on public roads so obviously we can't prevent anyone from trying to tag along, however because of the nature of the event (lots of turns and road changes) and because we have radios and your friend does not, it's very difficult for people to follow along. And unfortunately we cannot wait for friends who get stuck at red lights or miss an exit. The Dream Car Tour is a guided Tour - we drive together as a group and we bring two support vehicles along for the ride: a lead car (to set the pace) and a tail car (to make sure nobody falls behind). You can drive in any order you want provided you don't pass the lead car and don't fall behind the tail car. Often, there will be up to a mile between the lead and tail cars, so there's plenty of freedom on the road. We do require that you remain with the group, and we do not permit drivers to go explore by themselves. There are six vehicles on the Dream Car Tour. You'll get a chance to drive all six of them throughout the 3+ hour experience. Tours can accomodate a minimum of 6 and maximum of 8 drivers (actually, a bit more, but we'll explain that in the next question.) But wait - if there are 6 cars and 8 drivers, how does that work? Good question! Every participant will always have a chance to drive all six cars. We sometimes incorporate "rest" legs into the event -- which means at any time six folks will be driving and up to two folks will be taking a break and riding as passengers. We've found that three hours of intense driving all in one shot can be pretty exhausting, so by adding in rest legs, you get a chance to catch your breath for a few minutes. How does the "Dual Driver" option work? We offer an innovative way to share the Dream Car Tour experience with a friend called our "Dual Driver" option. Each of you pays a slightly lower per-person cost, and you'll always be together in all vehicles. Each time you switch vehicles, the two of you can change who does the driving and who sits shotgun. This lets you split the driving 3/3 (or 4/2, 5/1, etc.) so you both get to experience these amazing cars firsthand. Because the Dream Car Tour takes place on public highways and local roads, we drive as you would every day on the street - safely with the flow of traffic. On larger highways, that flow can be a nice brisk pace, while on twisty back roads, we'll take a pace that makes sure you enjoy the back-and-forth turns without slipping off an embankment. Our goal is to give you the true "exotic car owner" experience - we want you to know what it's like to drive these cars as if they were your own. And don't worry - everyone who comes on the Tour asks this question and always has a great time. We're not out to tease you with great cars that only go 40mph. Every vehicle on the Dream Car Tour is equipped with a two-way radio system that's capable of transmitting a signal miles away, so you will always be in contact with the support vehicles and the other drivers on the Tour. Instructions are given over the radio by the lead car before each turn and each exit, so you should have no problems staying with the group. But every once in a while you might make a wrong turn (it happens), and if so we'll make sure to guide you back to the group over the radio. Our goal is to give you the "exotic car owner" experience - unfortunately part of that experience is the reality that exotic cars draw a lot of attention, both wanted and unwanted. In the rare case that you are pulled over during the Tour, you will be responsible for any tickets received. I don't care about any of the cars other than the . Can you guarantee I get to drive it? The purpose of the Dream Car Tour is to give you an adrenaline-filled "sampler menu" of exotic cars - you get to drive six different vehicles from the world's best and most exciting manufacturers. Because of the nature of these high-performance vehicles, maintenance issues do arise and occasionally we must make vehicle substitutions. We therefore cannot guarantee any specific car will be a part of a given Tour. Dream Car Tours run rain or shine. We've been running events for over 3 years and our experience has shown us that even in the rain, the Tours are a tremendous amount of fun - in fact, some of the best testimonials we've received have been from participants that drove in the rain. No. All of the vehicles on the Dream Car Tour are either fully automatic or semi-automatic (F1-style 'paddle shifters'). How do I drive a 'paddle shift' transmission? Is it hard? Will you teach me? F1-style paddle shift transmissions are the latest innovation in high performance vehicles. Adopted from the transmission of the world's fastest professional race cars, it blends the performance and efficiency of a manual transmission with the ease and speed of an automatic. It takes about 10 minutes for a normal driver to get accustomed to driving a paddle-shift vehicle. We provide full instruction before we depart, and in no time you'll be driving and shifting like a pro! All drivers must be 21 years of age or older and have a valid driver's license and personal auto insurance. If you do not have personal auto insurance, several options are available to you - contact the Gotham Dream Cars office for details. Believe it or not, the answer is yes. In all 50 states, if you carry full-coverage insurance (that means Liability, Comp, and Collision) your insurance will automatically carry over and cover you when you rent a car from us - regardless of what you drive or what you rent. And it's for the same reason that if you're driving down the highway in your Camry and you happen to knock a Ferrari off the road, your insurance will cover the damage. What does the Dream Car Tour cost again? $1195 (+ tax) gets you behind the wheel of six of the most amazing cars you'll ever drive for three+ hours of fun. It's by far the best "bang for the buck" we offer here at Gotham Dream Cars. On the day of the event, we hold a $5,000 fully-refundable security deposit on a credit card. It's extremely rare that we ever need to access this deposit, but it does happen. Just drive safely and make sure to bring back the cars in the same condition they start and you'll be golden. The deposit is released when you return to home base from the Tour. That's what we like to hear. Head on over to our Reservation page and sign yourself up. See ya soon...!